In an earlier post we introduced the concepts of: real numbers, complex numbers, vectors and matrices. Let’s spend a little more time on the real and complex numbers. The need for a complex number came about when trying to take the square root of a real, negative number. A complex number is a pair of two numbers which are often written as a combination of a real number and an imaginary number, but can also be referenced as a pair of two numbers. 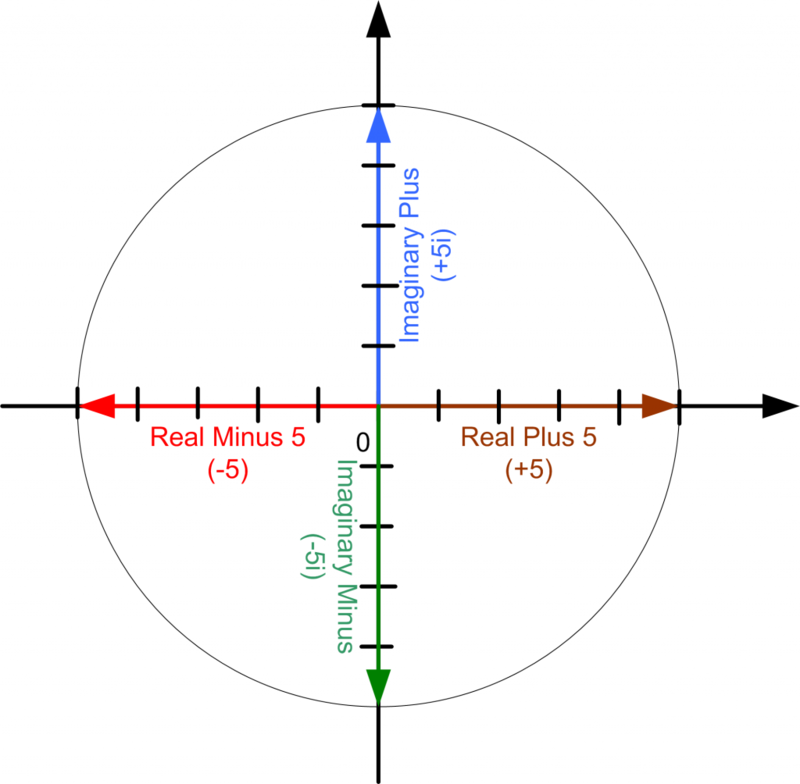 The real number tells us which way to go on the real axis and the imaginary number tells us which way to go on the imaginary axis. A negative real number means go to the left, and a positive real number means go to the right. For the imaginary number, a positive imaginary number means go up and a negative imaginary number means go down on the imaginary line. When noting complex numbers, form (Equation 1) is most often used. The “i” in (Equation 1) has an interesting property. Let’s work with a specific example now. Let’s look at real number 5 and the complex number 5*i. Number 5 means that starting from zero we go to the right 5 units, while 5*i means that starting from zero, we go up 5 units. This is equivalent to saying that 5*i is obtained by going to the right five units and then rotating counter-clockwise 90-degrees. Thus, multiplication by “i”: rotates the position of a number by 90-degrees, in the counter-clocwise direction. 1.From zero go right 5 units. 4.Arrive at 5 units to the left of zero. In conclusion, real numbers go to the left and right on the real axis. 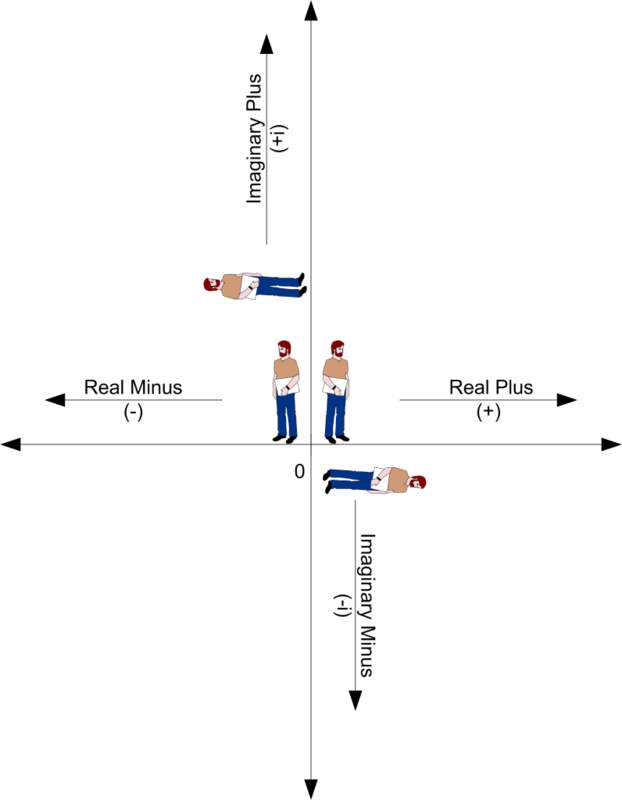 Complex numbers are pairs of real and imaginary numbers, with reals going left and right; and imaginary going up and down on the imaginary axis. The imaginary number is a real number multiplied by “i”. Multiplication by “i” is equivalent to taking the current number position and rotating it counter-clockwise by 90-degrees.